When someone mentions the name Samsung the first thing you think of is probably one of their high-definition flat screen televisions or maybe one of their popular Galaxy smartphones. Rightfully so, due to the quality products they have innovated and manufactured over the years. You can hardly have a discussion about Apple, without mentioning their primary rival, Samsung. Although this company has become one of the most recognizable brands in consumer electronics, this wasn’t always the case. Let’s take a deeper look at the origin and evolution of this company. Samsung was founded in 1938 by Lee Byung-Chul in South Korea. Samsung, when translated into english, stands for “three stars” or “tri-star”. The name of the company represented Lee’s intention for the company to become as powerful and everlasting as the stars in the sky. It seems apparent that his dreams have come to fruition. What is one of today’s largest multinational conglomerates started off as a simple grocery trading company with only forty employees. Now, the company employs over 320,000 people. After his early success with the grocery trading company, Lee went on to open up multiple businesses over the next thirty years, including a sugar refinery, insurance companies and retail stores. Lee’s vision for the company was to become a market leader in a variety of different industries, instead of putting all of his eggs in one basket. This business strategy of diversification is what ultimately led to the company’s evolution and expansion into the tech giant that it has become. 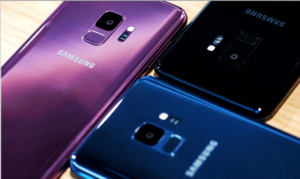 If the company had never ventured outside the realm of groceries, the world would have never experienced any of the popular Samsung devices in demand today. It wasn’t until the late 1960s that Samsung first stepped foot into the electronics arena. The first product that they created was a black and white television. In 1980 they acquired a facility where they began to produce telecommunications hardware. They started off by manufacturing switchboards. Eventually, the facility evolved into the main center of operations for manufacturing mobile phones. The company reportedly invested massively in research and development and as a result experienced rapid growth, pushing them towards the top of the list in the electronics industry. As of today, Samsung has produced over 800 million phones worldwide since opening this facility. Lee, who passed away at the age of 77 in November of 1987, is considered one of the most successful businessmen from South Korea. He had a vision for his company. He firmly believed in his dream, and fulfilled it as well. It is astonishing to think that what started as a grocery trading store has evolved into one of the largest and most successful companies in the technology industry. Lee’s legacy is a true testament to the fact that anybody can accomplish anything with hard work and dedication. As Samsung continues to thrive, don’t forget where it all started! If you have any questions regarding your device or about any information covered in this article feel free to reach out to us! You can reach us at (919) 263-2699 or schedule an appointment! If you have friends that need a repair you can sign up for our referral program. Earn $5 every time you refer a friend to TCR. They’ll get $5 off their repair, too! 3 unexpected companies are launching new phones?